I have installed the Enpass extension for Edge, but it won't show up in Edge's extension list. Am I doing something wrong? My guess is that I have to configure the extension through the extensions menu? I have already uninstalled and reinstalled the extension without success. I am running Win10 insider preview fast ring (18305). I don't know about you, but I am running Windows 10 Insider builds (currently at 18305.1003). Maybe it matters. Sorry for trouble. Are you not able to see Enpass extension icon? or Nothing happens when you click? Oh I see now. Microsoft is still publishing listings for new releases. I might take few hours to complete for your country. The icon doesn't show and it's also not listing in Edge's extenion list. Windows and the store do report it as installed though. The store description is already showing V6 of the extension for me, but maybe it's an outdated version? I have version 6.0.7.0 installed. Sorry for the inconvenience. Please follow the following steps. Visit browser extensions page on Enpass website to install the latest extension Edge. You’ll be directed to Microsoft Store. Install and launch to run the extension, and you’d be redirected to the Edge browser with a pop-up asking for your permission to turn the extension on. Click Turn it on to enable the extension. If Enpass icon doesn’t show up in the toolbar. Go to the option ⋯ in the top right corner. You’ll see the Enpass icon there, right-click on the Enpass icon and choose Show next to address bar. There is a problem with your website and it is not accessible now. Unable to download all browser extensions, clicking the extensions button will not respond.I need the download address of the enpass6.0 Firefox Browser extensions. How is this any different from installing it directly from the store (which is what we do). I followed these instructions and they don't help at all. The store and OS still think it's installed, but Edge doesn't list it, the icons doesn't appear in Edge and it doesn't work. This topic is about the Edge extension, please keep you reply on-topic , or start your own thread please. I have followed that route and it didn't work. The extension doesn't show up in Edge. Since we are not idiots, we already checked that. And no, that is not the problem at all. 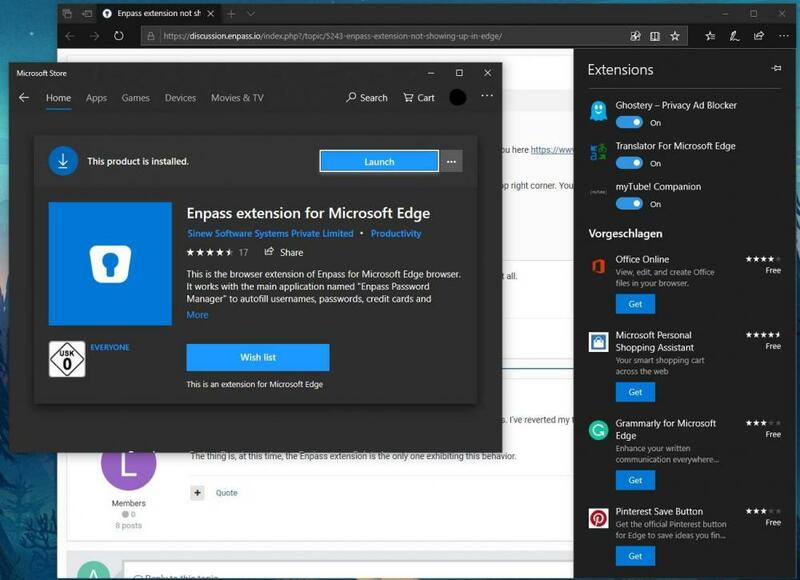 As stated before, Edge doesn't list the extension in its extensions listing. I'm starting to suspect the issue may be caused by running WIndows Insider builds. I've reverted my tablet to the production release of Windows 10 1809, and there the externsion seems to be working fine. The thing is, at this time, the Enpass extension is the only one exhibiting this behavior. @Hemant Kumar, as laibalion replied. that doesn't help. I agree with laibalion, it's probably due to the insider build. laibalion replied. that doesn't help. That is probably true, however all my other extensions work. I thought so too, until I complete reset Edge in the last build and suddenly I couldn't properly install and use any extension anymore. Just to close this. After receiving some further Windows Insider updates, the issue is gone. The Enpass Edge extension shows up and works fine.